Sesame Oil is made from crushed sesame seeds. There are three types of oil that is made, and they can’t really be swapped for each other. The seeds are toasted, crushed, then the oil is filtered, resulting in an amber-coloured oil with mild, slightly-smoky flavour and taste. Don’t use large quantities of this for cooking something in, as the flavour is too pronounced and will overwhelm the flavour of most other foods. Use for flavour accents and for marinating in small amounts. It has a smoke point of 175 C / 350 F .
This is a “cold-pressed version” of the above, for which the seeds aren’t toasted first. It results in a milder flavour and paler colour. 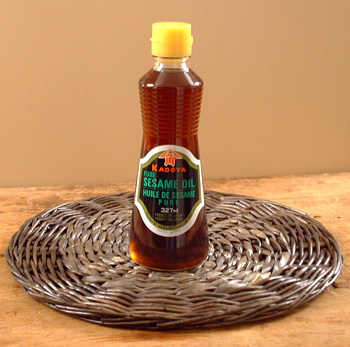 You can use Light Sesame Oil for frying and salad dressings. It has a smoke point of 175 C / 350 F.
This is actually a semi-refined version. The oil is extracted using heat. It has less flavour and aroma, but with its higher smoke point ( 232 C / 450 F) it is much better for sautéing or stir-fries. Make a dipping sauce for sushi by combing a bit of sesame oil and soy sauce with a dash of sugar. Good in stir fries. Dark and Light Sesame Oils are very different from each other, and can’t really be swapped. Use another oil entirely. Just store on the shelf at room temperature; no need to refrigerate if you will go through a bottle in about a year. If a bottle lasts you longer than that, you may want to refrigerate it because like all oils, it will eventually go rancid, and refrigeration will extend its storage life. If you have a bottle you haven’t used in a very long time, always sniff it first before adding it to something to ensure it hasn’t turned on you.